Abandoned by her husband, Amanda Wingfield comforts herself with recollections of her earlier, more gracious life in Blue Mountain when she was pursued by 'gentleman callers'. 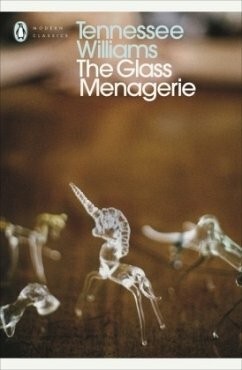 Her son Tom, a poet with a job in a warehouse, longs for adventure and escape from his mother's suffocating embrace, while Laura, her shy crippled daughter, has her glass menagerie and her memories. Amanda is desperate to find her daughter a husband, but when the long-awaited gentleman caller does arrive, Laura's romantic illusions are crushed. Tennessee Williams was born in 1911 in Columbus, Mississippi, where his grandfather was the episcopal clergyman. When his father, a travelling salesman, moved with his family to St Louis some years later, both he and his sister found it impossible to settle down to city life. He entered college during the Depression and left after a couple of years to take a clerical job in a shoe company. He stayed there for two years, spending the evenings writing. He entered the University of Iowa in 1938 and completed his course, at the same time holding a large number of part-time jobs of great diversity. He received a Rockefeller Fellowship in 1940 for his play Battle of Angels, and he won the Pulitzer Prize in 1948 and 1955. Among his many other plays Penguin have published The Glass Menagerie (1944), A Streetcar Named Desire (1947), Summer and Smoke (1948), The Rose Tattoo (1951), Camino Real(1953), Cat on a Hot Tin Roof (1955), Orpheus Descending (1957), Sweet Bird of Youth (1959), Period of Adjustment (1960), The Night of the Iguana (1961), The Milk Train Doesn't Stop Here Anymore (1963; revised 1964) and Small Craft Warnings (1972). He died in 1983.